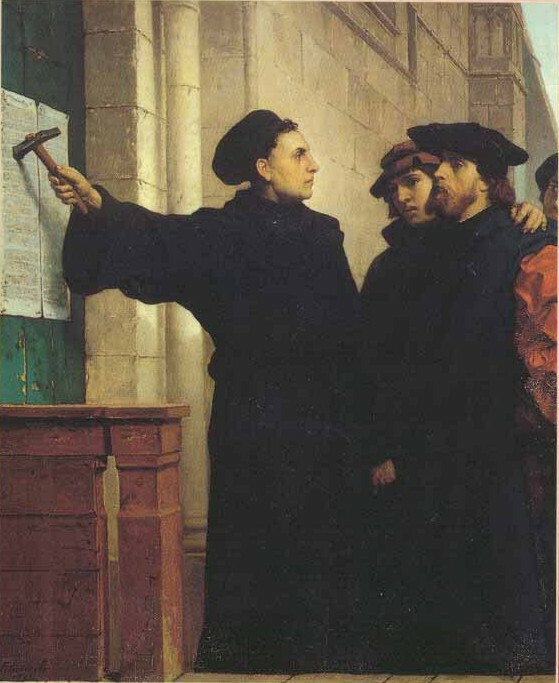 The traditional date for the start of the Reformation is October 31, 1517, due to Luther’s posting of the 95 Theses on the door of the Wittenberg Castle Church. The impetus for this was the controversy over indulgences. Papal indulgences went back to the eleventh century, when Urban II offered a plenary indulgence for all who participated in a crusade. Scholastic theologians of the thirteenth and fourteenth centuries expanded the argument to include the papal authorization of forgiveness and thus release from purgatory in exchange for acts of penance. The theological rationale was that a treasury of merits had been created through the death of Jesus Christ and the martyrs, merits which they did not need for salvation, but could be commuted to others who did require them. The church under the authority of the papacy was given freedom to transfer those merits to other parties, above all those in purgatory. The sale of indulgences became a means for obtaining church financial support and in the case of sixteenth-century Germany was the source Albrecht von Hohenzollern used to repay the debt he incurred purchasing a papal dispensation to obtain the Mainz bishopric. In 1515, Leo X published a papal bull suspending all other preaching or sale of indulgences in the lands of Albrecht (Mainz, Magdeburg, Brandenburg) other than those instituted for the purpose of repaying the loan the new archbishop of Mainz took out for his see, with half of the proceeds going to the project of rebuilding St. Peter’s in Rome. Albrecht commissioned the Leipzig Dominican John Tetzel to this end and over the course of 1517 he preached indulgences throughout the region, even reaching the border of Saxony, where parishioners from Wittenberg would travel to obtain them. It was there that they heard Tetzel’s famous cry, “When the coin in the coffer rings/the soul from purgatory springs,” and brought it back to Luther. While the local sale of indulgences was the impetus for Luther’s writing, his rethinking of certain scholastic assumptions about sin, grace, and free will led the Wittenberg professor to question the penitential theories supporting the sale of indulgences. Throughout many of his early lectures, including Psalms (1513-1515) and Romans (1515-1516), and sermons, Luther had already criticized the theology behind indulgences. Then on October 31, he sent letters both to Albrecht and to the bishop of Brandenburg expressing reservations about Tetzel’s preaching of indulgences. This was the same day he posted his 95 Theses, written in Latin for disputation amongst clerics and students. The pivotal first thesis questioned the entire understanding of penance, which was not something one does, but should characterize the entire life of the believer. The remaining theses argue that penance is not for the dead, but for the living and that the pope has no power to remit sins of the dead, criticizes the theological foundation of indulgences in the treasury of merits, and rebuts many of the popular ideas indulgence preachers were peddling. But at this stage Luther still supported the practice of indulgences and later in his career stated clearly that he had no intention of attacking the practice of indulgences or the authority of the pope and instead sought to curtail abuses of the practice. The theses were purportedly nailed to the door of the castle church, All Saints’, with the goal of convening a disputation. But the Latin manuscript was immediately translated into German, published, and circulated broadly. The reaction surprised even Luther and led to both support and criticism. The most significant responses were those of Albrecht, who after receiving an opinion from theologians at Mainz requested an examination of the theses by the curia for their apparent opposition to papal authority and church doctrine, and John Eck, the professor of theology at Ingolstadt whose rejoinder ultimately led to the Leipzig Debate.